The night sky depicted by van Gogh in the Starry Night painting is brimming with whirling clouds, shining stars, and a bright crescent moon. The setting is one that viewers can relate to and van Gogh´s swirling sky directs the viewer´s eye around the painting, with spacing between the stars and the curving contours creating a dot-to-dot effect. These internal elements ensure fluidity and such contours were important for the artist even though they were becoming less significant for other Impressionists. Thus Starry Night´s composition was distinct from the Impressionist technique of the 19th century. The artist was aware that his Starry Night composition was somewhat surreal and stylized and in a letter to his brother he even referred to "exaggerations in terms of composition. " The vivid style chosen by van Gogh was unusual - he chose lines to portray this night scene when silhouettes would have been a more obvious choice. In Starry Night contoured forms are a means of expression and they are used to convey emotion. Many feel that van Gogh´s turbulent quest to overcome his illness is reflected in the dimness of the night sky. The village is painted with dark colors but the brightly lit windows create a sense of comfort. The village is peaceful in comparison to the dramatic night sky and the silence of the night can almost be felt in Starry Night. The steeple dominates the village and symbolizes unity in the town. In terms of composition, the church steeple gives an impression of size and isolation. In the left foreground is a curvy cypress tree which is typically associated with mourning. It is painted in the same way as the sky with fluid lines which enhances the flow of the Starry Night painting well as its easiness on the eye. Van Gogh´s choice of color in Starry Night has been much debated, particularly the dominance of yellow in this and other late works. Some believe van Gogh may have been suffering from lead poisoning or a type of brain disease and that this explains his strange use of color in later paintings. 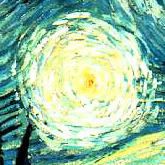 Van Gogh's use of white and yellow creates a spiral effect and draws attention to the sky. Vertical lines such as the cypress tree and church tower softly break up the composition without retracting from the powerful night sky depicted in Starry Night. Vincent van Gogh´s choice of dark blues and greens were complemented with touches of mint green showing the reflection of the moon. The buildings in the centre of the painting are small blocks of yellows, oranges, and greens with a dash of red to the left of the church. The dominance of blue in Starry Night is balanced by the orange of the night sky elements. Van Gogh´s passion for nighttime is evident in the Starry Night painting, where the powerful sky sits above the quiet town. It seems that van Gogh is contrasting life and death with luminous stars and a gloomy, peaceful village. The main light sources are the bright stars and crescent moon. There are various interpretations of Starry Night and one is that this canvas depicts hope. It seems that van Gogh was showing that even with a dark night such as this it is still possible to see light in the windows of the houses. Furthermore, with shining stars filling the sky, there is always light to guide you. It seems that van Gogh was finally being cured of his illness and had essentially found his heaven. He also knew that in death he would be at peace and further portrays this by using bold colors in the Starry Night painting. In a letter to his brother, Theo, van Gogh comments: "I should not be surprised if you liked the Starry Night and the Ploughed Fields, there is a greater quiet about them than in the other canvases. " Later in the letter he makes reference to Leo Tolstoys book My Religion and its lack of belief in resurrection. Such fleeting mentions of religion echoed van Goghs feelings towards the subject at this time; he could neither forget it nor totally accept it. Despite this, his use of the word 'quiet' and reference to Tolstoys book indicates that the night sky made him feel calm and brought to mind eternity. Starry Night shows the vast power of nature and the church spire and cypress tree - representing man and nature - both point to the heavens. 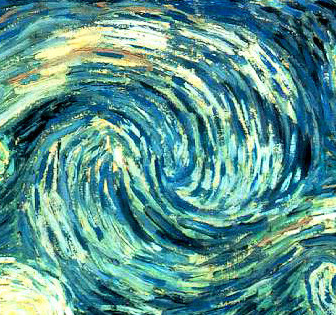 In Starry Night van Gogh´s unique, thick brush strokes are very much obvious and it´s possible that his severe attacks further dramatized his brush work. However, there is a consistency to his technique that adds even more depth as well as a rich texture to this work of art.